Mark Diaz recently completed the 2018 Bodybuilding.com $250,000 Transformation Challenge! His results were excellent and I wanted to share the path we followed to achieve these results. 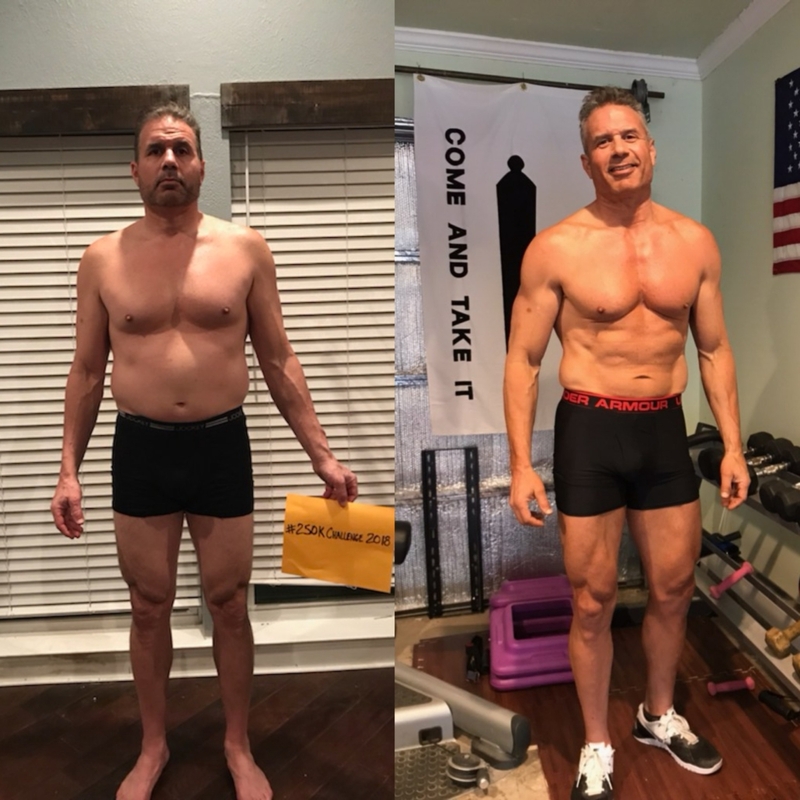 Mark is a lifelong athlete, what I would consider a pretty advanced lifter, and someone who has participated in body transformation challenges before. So he had a lot going for him before we ever got started, but nonetheless a good road map and a lot of hard work were still critical to his success. Hopefully this quick overview provides some education and/or inspiration for someone looking to get results like Mark. Starting Point: Mark started in early January at just under 220 pounds. He was consistently going to the gym, though he lacked structure to his training, and his diet habits were already pretty good to begin with. His only real hindrance in the gym was some nagging shoulder pain. Three Days of Steady State Cardio at 35 minutes, any machine, heart rate between 135-145 bpm, post workout or fasting. One Day of HIIT Cardio –five minute warm up. Then eight rounds of: 15 second all-out sprint, 45-second cruise. Then a ten-minute steady state low-moderate intensity cruise, using the last two minutes as a cool down. Performed separate from weight training, either later in the day, or on a day all its own. Spend ten minutes doing three or four of these activities: Jump rope, battle ropes, heavy bag, med ball slams, kettlebell swings. For each of these, you can do one minute on, one minute off to start, then weekly work for improvements like 90 seconds on, one minute off. 90 seconds on, 45 seconds off, etc. Bleacher Sprints with Track walk. You can get creative with formats, but one workout I like is four sprints up the bleachers, then a recovery walk for one lap. If you walk a mile, that makes for 16 sprints and it’s a great workout. Through the entire transformation, we relied on a carb cycling program. His diet basically consisted of a four-day rotation. One high carb day, followed by three low carb days, and repeat. His caloric intake in the beginning was around 2600 calories on his high days and 2100 calories on his low days. We used cheat meals sporadically throughout the challenge for a metabolic boost, to load up for big workouts, and for a mental break. We maintained the same rotation for the entire 12 weeks and every few weeks would make some modifications by removing either fats, carbs, or both, depending on his results. Mark’s supplementation routine was pretty basic, except for his intra workout nutrition, which was a MountainDogDiet inspired concoction to aid his muscle growth and recovery. We used Whey Protein Isolate shakes a couple times per day as part of his diet. BCAAs during cardio, Glutamine to support recovery, and some basic health supplements like multivitamins and joint support. During his workout, we used Post Lift by Nutrex mixed with Peptopro by True Nutrition. As you can see by Mark’s photos, we were successful in not only losing a lot of body fat but adding and shaping his lean muscle mass. The strength increases he experienced throughout the transformation challenge were also very noteworthy. We could’ve possibly pushed his diet and cardio harder to lose more body fat, but in my opinion, it would’ve likely come at the cost of those strength gains and muscular changes. I mentioned that he started with a nagging shoulder issue, which did not hold us back much at all. Most of the issue was alleviated by changing his form on his presses. Like many people, he pressed with “high elbows,” which put a lot of pressure on the front of the shoulder joint. Narrowing his grip a bit, keeping his elbows in line with his wrists and close to his body helped the shoulder pain and also increased his press strength. A Great Baseline – Mark started in a great place. This cannot be discounted. Good muscularity, good habits, and good knowledge of what to expect through the process; he was well prepared. Great Program Adherence – Mark followed the program perfectly. Aside from a few unavoidable missed workouts due to work travel, Mark gave his best effort for 12 weeks. Well Planned Custom Program – Mark’s diet, cardio schedule, training, and supplementation were put together to create a synergistic effect that maximized Mark’s hard work.